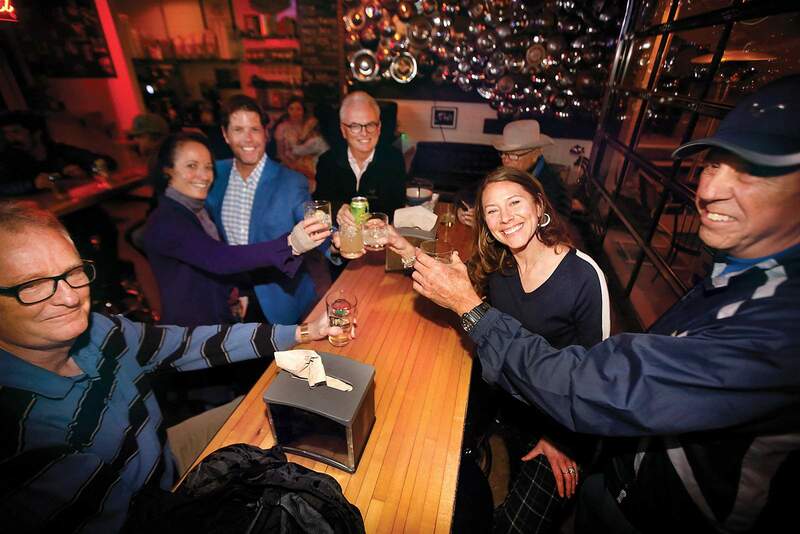 Christina Rinderle, center right, calls for a toast with supporters of ballot measure 1A on Tuesday night with, from left, Ed Horvat, Ellen Stein, City Councilor Chris Bettin, City Councilor Dean Brookie and Rich Hoehlein at 11th Street Station during an election watch party. Rinderle led the small-issue committee Citizens for Making Durango A#1, which promoted the tax increase. Durango voters narrowly approved a half-cent sales tax increase Tuesday to pay for road improvements. Unofficial results had 2,305 residents in favor of the sales tax increase, while 2,110 residents opposed it, a difference of 195 votes. “I’m feeling hopeful and grateful that the community recognized the need for our town,” said Christina Rinderle, who championed the sales tax. Two small-issue committees raised money and campaigned either in support of, or in opposition to ballot measure 1A. Citizens for Making Durango A#1, which Rinderle worked on, encouraged residents to vote for the tax increase. United for Durango’s Future, led by former City Council candidate David McHenry, asked voters to reject the tax increase. Rinderle said paying for street repairs now will save the city money in the future. If roads fall into disrepair, it is exponentially more expensive to fix them. McHenry told voters the city already has the money it needs to make the improvements – it just isn’t managing its budget responsibly. After election results were posted, McHenry said he wasn’t optimistic his position would prevail. But “it’s not the end of the world,” he said. Durango voters rejected a ballot measure in November 2018 that proposed increasing sales and property taxes to pay for street infrastructure, a new police station and other related building improvements. Ballot measure 2A failed by more than 20 percent. Rinderle said ballot measure 1A “closed the gap” that the city saw in the November 2018 election.